Even though I didn't grow up Catholic, my father did, so during Lent we always ate fish on Fridays. My mother was a great baker and cooked amazing roasts, but fish was not her forte. She made a tasty curried shrimp - basically shrimp and chopped vegetables with some curry powder served over rice - and she sauteed sole that she breaded, which tasted yummy. It wasn't until after I married a Burhop that she really got into cooking fish, much to the delight of my father, who was an avid fisherman. Salmon became a Friday staple at their house, any time of year, not just during Lent. Dad loved walleye, trout, whitefish, lake perch - all the catch he ate on fishing trips up in Canada, and with a Burhop son-in-law, he could get them fresh year-round. As huge fish lovers, we are somewhat skeptical that giving up meat on Fridays to eat seafood is a penance -- especially since we eat fish at least three times a week. We're either spectacularly penitent , or we just like to eat well. But we're very grateful for the wonderful customers who come to us every Friday during Lent - many of them get into the habit and just keep coming back. So for those of you looking for some tasty, simple recipes for your Friday fish dinner, check out our web site, www.burhopsseafood.com - just click on "recipes" or watch our cooking videos. Allow 6-8 oz. of trout or salmon per person. Grind up about 1/2 cup pecans, enough for 2 to 3 fillets, in a blender until the pieces are all small. Some of it will look like pecan dust, which is perfect. Rub the fillets with a little olive oil, press the ground pecans evenly into the flesh of the fish, and either saute in a heavy frying pan with a little olive oil (trout), nut side down first, 3 minutes per side, medium high heat; or bake in the oven (trout or salmon), nut side up, at 425 degrees for 8 to 10 minutes. Serve with a lemon wedge, herb roasted potatoes and a green vegetable - delicious and heart healthy as well. If you do this with salmon fillets, I suggest that you sear and bake the nut crusted fillet, or just bake, allowing 10 minutes per inch of thickness at 425 degrees. Salmon is thicker than trout, so it will take longer to cook. If you're a family with two working parents, or a busy mom (aren't all moms busy?) try our prepared entrees - our gluten-free Salmon Papillotes have fresh vegetables wrapped in parchment paper in with fresh salmon, three varieties to choose from: Provencal, with fennel, cherry tomatoes, garlic, red onions and thyme; Au Jardin, with carrots, squash and herbs; Mediterranean, with olives, tomatoes and Mediterranean herbs. You just moisten the paper with water or some white wine and bake for 20 minutes at 425 degrees. All you need to add is some potatoes or fresh crusty bread - we have both available. Other oven ready entrees we have include our Stuffed Salmon Fillets and Salmon Cozies, all ready to just pop in the oven. 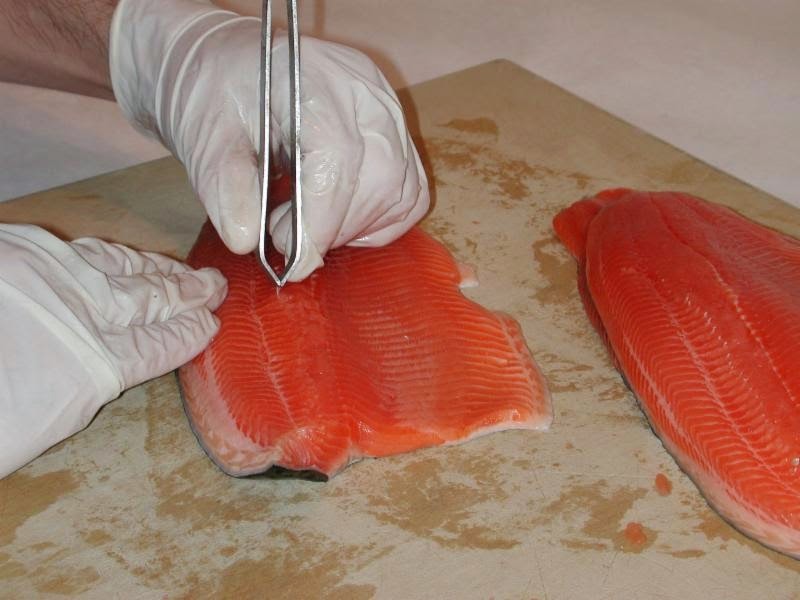 These are made with fresh salmon, but we will make them with fresh trout or tilapia by special order, just call at least 24 hours before you want to pick them up. Crumby Scrod was always a favorite for our children, another 4-ingredient recipe. All you need is fresh fillets of cod, scrod or haddock, fresh soft bread crumbs, butter and lemon juice. Take some day-old bread and grind it up in your blender until it's uniform. Melt 3 Tbs. of butter or butter substitute in a glass ovenproof dish in the microwave. Preheat oven to 425 degrees. Add a healthy squeeze of lemon juice to the butter and add the raw fish to the glass pan, turning to coat both sides. Then add the bread crumbs, spooning the remaining butter over the top. Bake for about 10-15 minutes, depending on the thickness of the fish. Serve with a lemon wedge and some Burhop's tartar sauce. We have lots more recipes on our web site - but remember our caveat: we only guarantee our recipes with our fish. If the fish you buy elsewhere is previously frozen or not quite fresh enough, the greatest recipe in the world isn't going to make it taste good. We've discovered over the years that a lot of people who think they can't cook fish are just people who bought bad fish to start with. If not handled properly by a retailer, fish becomes "fishy" very quickly. Our suppliers know better than to try and sell us something inferior - but fish that we reject ends up somewhere. Don't let it be in your kitchen! Have a favorite, simple fish recipe to share? Just reply to this blog. Last week I talked about how eating fish, especially those high in omega 3s, is good for your heart. The reason the American Heart Association picked February as National Heart Month isn't because of the great weather for some heart-healthy exercise, it's because of Valentines Day, the holiday of the heart. My daughter was born on Valentine's Day, so I have a special affinity for Feb. 14, even though a lot of people just consider it a Hallmark day. The truth is, a celebration has taken place in mid-February for over 2000 years. From Feb. 13-15, in Rome, they celebrated Lupercalia, a fertility rite that included the sacrifice of a goat and a dog, followed by naked men lashing the ladies with strips of bloody hide from the goat. Apparently, they thought this would make the women more fertile, so the ladies lined up for the lashing. Then there was some thought that they put their name, written on papyrus, perhaps, into a jar, and young single men drew out a name, their partner for the next year, sometimes leading to marriage. The original match.urn. (Other accounts say this happened much later, not at the time of Lupercalia). February 14th was also the date that the Romans felt was the start of the bird mating season, perhaps a possibility in warmer Italy. Birds are feeling romantic, so everyone else should, too. When Christianity took over, it was decided that Lupercalia was not an appropriate celebration. Pope Gelasius (492-496 AD) banished the celebration of Lupercalia in favor of a day to honor the Virgin Mary. Goats and dogs rejoiced. There were as many as three men named Valentine who were martyred, all supposedly for reasons of the heart, but the records are murky. They sort of melded into one, and at least one of them was killed and buried on Feb. 14th, so that became St. Valentine's Day, evidently supplanting the Virgin Mary, who was moved to May, the month named after her. However, it was not really a "romantic" holiday until the 14th century, when Chaucer wrote of it as such, but with reference to birds mating rather than people. Shakespeare added to the mythology in Hamlet, when he wrote a Valentine ode to Ophelia - and look how that relationship ended up. What are you going to do for your Valentine? How about making him/her a meal that says not just "I love you," but "I want you to live longer." Get one 6 oz.-8 oz. ruby red trout fillet per person. Put 1/2 cup of pecan pieces in a blender and process until fairly uniform in size, i.e. no big pieces left. Rub the fish with a little olive oil and press the processed pecans into the trout flesh. Either saute the fish in a large, heavy pan in a little more olive oil, doing the nut side down first for 2-3 minutes, then turn skin side down for 2-3 more minutes at medium high heat; or bake in a 425 degree oven for about 8 minutes. Serve with lemon wedges, herb roasted potatoes or garlic mashed potatoes and a fresh green vegetable or salad. Shell fish get a bad rap for being high in cholesterol - but they're plant sterols, much healthier than what you get in red meat. If your sweetheart loves shellfish, go ahead and get him/her a live lobster, lobster tail or crab legs. The secret to heart healthiness is in what you serve it with - melted butter is not heart healthy. Our lemon dill sauce is much more heart-healthy and tastes great with both crab and lobster - just brushing the crab or lobster with olive oil and lemon juice tastes delicious, too. And the most romantic of all - oysters. Oysters are a renowned aphrodisiac, loaded with vitamins, omega 3s and trace minerals that are great for your heart. We can teach you how to open them with an oyster knife, but we also discovered the easy way to do it - put them 2 at a time in your microwave, and turn it on for 3 or 4 seconds. They should pop open - we did this with some kumamotos that were really hard to open, and it was like magic. If you want more ideas for Valentine's Day delicious, heart-healthy meals, I will be at our Hinsdale store on Feb. 13th from 1-3 pm, and at our Glenview store on Feb. 14th from 1 - 3 pm. Come and get some great ideas for your favorite Valentine that won't clog arteries! February is Heart Month - how are you taking care of yours? Buried in the middle of all this good advice was one line, saying that cardiologists recommend that their patients eat the fish high in omega-3s at least twice a week. They mentioned salmon, herring and sardines. I'd like to add ahi tuna, albacore tuna, mussels and rainbow trout, all good sources of omega 3s..
A cardiology practice near our Glenview store approached us a couple of years ago to do a cooking class for some of their patients, because they wanted them to eat more fish. Their patients' biggest complaint was that they (or their spouse) didn't know how to cook fish, so they only ate it when dining out. We held the class in the store, which was a bit cramped for the 18 patients and 5 doctors who came. We showed them how to make simple recipes, like Ruby Red Rainbow Trout with Pecan Crust - as well as letting them taste our prepared entrees that are heart healthy, like our Au Jardin and Provencal Papaillotes. The heart patients were literally moaning with pleasure. One man said if he could have fish that good, he'd eat it every night. For some unknown reason, the media in the US tiptoes around the issue of fish being good for heart health. Cardiologists WANT their patients to eat more fish. The media tells us to be afraid of mercury (see my last post). Countries with the greatest longevity in the world are mostly places where fish is a big part of the local diet. In the top 10: Japan (where they eat fish several times a day), Singapore, Hong Kong, San Marino, Iceland, Italy, Sweden and Australia, all nations where fish features on the menu many times a week. The two exceptions on the list - Andorra, a tiny nation in the Pyrenees, and Switzerland, where they eat fresh water fish, but not like in the other countries on the list. Of course, other things figure into these country's longevity stakes - like good national healthcare systems, greater exercise, better over-all diet. Where does the US come on the list? 36th. Ask yourself, in a country where heart disease kills more men and women than anything else, why aren't we emulating the diet of countries where people live a lot longer than we do? This year, the best thing you can do for your Valentine is vow to make sure you eat more fish. If you don't know how to cook it, ask us - it cooks quickly, and when it's really fresh, it's possibly the tastiest thing you can eat. We have lots of simple, heart-healthy recipes on our web site - check them out at www.burhopsseafood.com. Give the people you love the gift of good health for Valentine's Day - encourage exercise, fresh fruits and vegetables, and a lot more fish than red meat. Their hearts will be grateful.